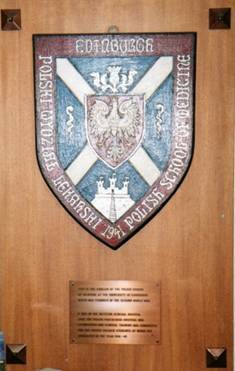 This is the emblem of the Polish School of Medicine at the University of Edinburgh which was founded in the Second World War. It was in the Western General Hospital that the Polish Paderewski Hospital was established and clinical training was conducted for the Polish Soldier-Students of which 227 graduated in the year 1941-49. The plaque was lost for many years until it was found. Now it may be found at the entrance of the Outpatient building of the Western General. It was unveiled in 1979 and among those attending the ceremony was Dr W. Tomaszewski. 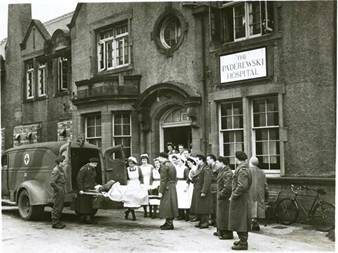 The hospital was opened on the 17th October 1941 in the presence of General Sikorski, the Deputy Prime Minister Mr S. Mikolajczyk, the Lord Provost of Edinburgh, Sir Henry Steele and others. The unveiling of the plaque was performed by Princess Alice, the Duchess of Gloucester who had recently assumed patronage over the hospital. Also present was Lord Rosebery and Professor Jurasz. 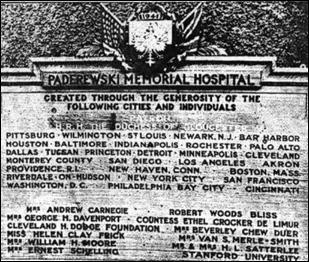 In 1942 the Duchess of Gloucester unveiled an ornamental commemorative plaque in the lobby of the Paderewski Hospital. 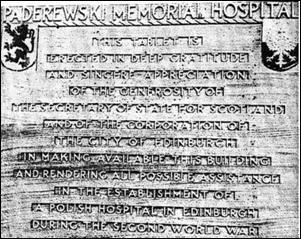 It states : - This tablet is erected in deep gratitude and sincere appreciation of the generosity of the Secretary of State for Scotland and the Corporation of the City of Edinburgh in making this building available and rendering all possible assistance in the establishment of the Polish Hospital in Edinburgh during the Second World War. Unfortunately, this plaque was stolen. The most generous benefactor was the U.S. Paderewski Testimonial Fund of New York, named after Ignacy Paderewski a concert pianist and accomplished composer. He was at various times the Polish Prime Minister and Minister of Foreign Affairs. “The search is on for a lost plaque thanking the City of Edinburgh for setting up a Polish hospital during the Second World War.” Click Scotsman article 16th October 2006 to read the story. Another tablet which met the same fate was that given in memory of the American donors to the Paderewski and was unveiled in 1944 by the wife of the American Ambassador to Britain.